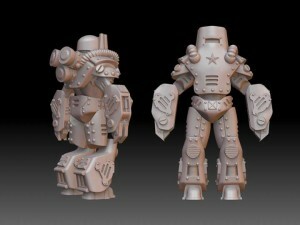 Clockwork Goblin Minis is showing off a preview of the 3D render WIPs for their Soviet Infantry. Not finished yet, but here is a work in progress shot of the Russian Infantry, the first of the Soviet models due to be released soon. This kit will have small arms, heavy weapons and an officer option in the platoon pack. Stay tuned for a sneak preview of the T 34 Tremor Cannon and the British Automatic Soldiers!